Emily Andrews, Executive Director of the USGBC-Missouri Gateway Chapter, and Nick Bristow, Senior Associate and Sustainability Manager at Forum Studio and Board Chair of the USGBC-Missouri Gateway Chapter, responded to the St. Louis Business Journal’s August 18 cover story on the LEED green building rating system in a commentary piece titled LEED gets it right. Read on for their full response. The Aug. 18 cover story on the LEED green building rating system missed the bigger picture. Green building rates in the St. Louis region may not measure up to the top five LEED national markets, but as your article points out, we are keeping pace with and even outpacing cities of similar size and demographics. By looking at just a single year of data, however, you are discrediting previous years of successful LEED projects in our region. More importantly, you missed the opportunity to recognize the local architects, engineers, contractors, consultants, owners and occupants who have championed buildings that conserve natural resources and support the health of humans and the planet. 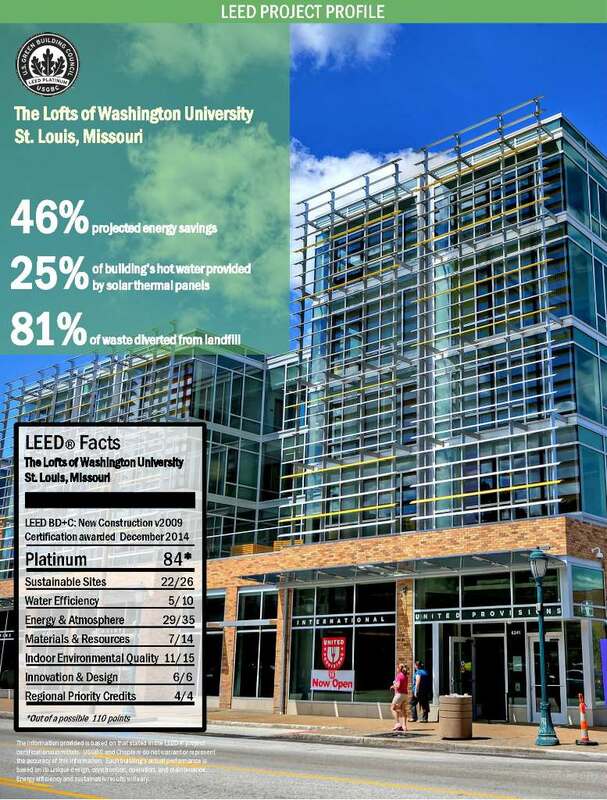 The St. Louis region has seen a consistent number of LEED certified projects annually between 2011 and 2016, even as the rating system has become more rigorous. Since 2000, 190 commercial and institutional buildings have achieved LEED certification. Our mission is to accelerate the implementation of green building principles for all. While every building cannot be a LEED building, these 190 buildings have provided a real-life, local case study and framework for our community to follow. And really, when it comes down to it, we are not out to compete with other cities, but to work within our own community to improve our buildings. LEED continues to be the international benchmark in green building, designed to incorporate continuous improvement, evolve and raise the bar as building technology improves. According to a 2017 Department of Energy study, LEED- and Energy Star-certified buildings improve net operating income by 28.8 percent and reduce operating costs by 17.6 percent. We cannot be content to merely track levels of certification or the numbers of certified buildings – we want better, higher performing buildings. The average American spends 90 percent of their time indoors – at work, at home and at school. Additionally, buildings in the United States consume about 40 percent of the country’s total energy consumption and represent 45 percent of greenhouse gas emissions. We all deserve better buildings. Tools like LEED, Energy Star and others are available to help us work towards better buildings – we should utilize them to improve the long-term health of St. Louisans, our region and the planet on which we reside. U.S. Green Building Council – Missouri Gateway Chapter considers the benefits of green buildings to far outweigh any costs. We also believe in a future where everyone has access to work, live and learn in a green building. We invite our region to be a part of this future. And we challenge each of you to pursue greener operations, maintenance, design and construction for every building in our region every step of the way. 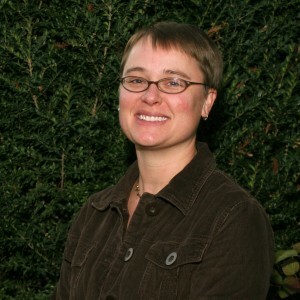 A half-day how to improve building and site performance, featuring Marc Lopata, Paul Todd Merrill and Lois Sechrist from the USGBC-MO Gateway Speakers Bureau; Jason Peterein from MSD and Steven Ibendahl from the Heartlands Conservancy. COST: $50 for Engineers Club or USGBC members; $75 for non-members. A few weeks ago, I had the opportunity to attend an open house at Crossroads College Prep’s new Science Wing. I’ll tell you what, those kids are lucky to attend school in such a lovely space. Skylights and tall windows grace the addition – I’m pretty sure these students may even enjoy going to school! I was lucky enough to attend both grade school and high school in buildings with significant daylighting and views to the outside since old and historic buildings often provide both. My classrooms, however, were so hot in January that we had to crack the windows. Probably not the most energy efficient solution! And indoor air quality and green cleaning products were not on too many radar screens. Since students were involved in the planning of the new space, it includes a lot of great “hanging out” space. The new Library features lots of comfy seating as well as tall windows that reduce glare and have high insulating value. The labs are not only state of the art, roomy and open, but also feature solar hot water heating. And the garden outside does double duty – it looks beautiful, featuring plants native to Missouri and helps reduce stormwater run off. The open house featured remarks from school officials, parents and students and it is quite clear from the remarks and from the conversations at the open house that everyone is very proud of the new space! Learn more about Crossroads College Prep’s green efforts. And get a peek of the space for yourself at our No Cost Ways to Green Your Schools program on October 28! 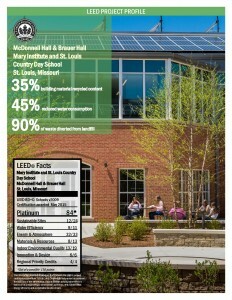 New LEED certified projects in St. Louis! USGBC-STL recently awarded a LEED plaque to Enterprise Holdings for their LEED Certified Contact Center (see photo below). Accepting the plaque on behalf Enterprise Holdings were Cindy Oberkirsch, General Contact Center Manager and Ken Kreh, Vice President. As you can see from the photo a number of the project team members also joined us. This is when I take great pleasure from my job as the Chapter Executive Director. After months and months (and sometimes years) of working on a project, the reward of official recognition from the USGBC with a LEED plaque and certificate bring smiles to most faces. The Chapter is always honored and excited to be involved in LEED plaque presentations! Congratulations to Enterprise Holdings for the LEED certification of their second building! 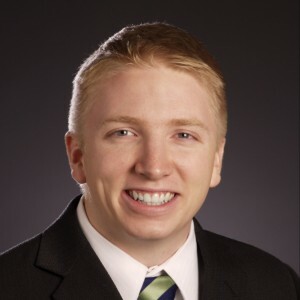 The 66,000 square foot building houses Enterprise’s St. Louis Contact Center, which processes reservations and roadside assistance calls from customers. Among other green features, the building has water-efficient faucets, low-flush toilets and HVAC systems that minimize energy consumption. Employee health and wellness was important to the project. White noise eliminates excess noise and makes taking calls easier; a walking track around the perimeter of the building encourages physical activity and indoor air quality is monitored. Cannon Design Powerhouse – GOLD. Check out Cannon Design’s new headquarters on our annual LEED Building Tour on September 9. Midwest Testing – SILVER. Midwest Testing, located next door to Alberici’s LEED Platinum Headquarters, is a two-story, 25,000-square-foot facility with 14,000 square feet of office space and 11,000 square feet of lab and support facilities. The building features mechanical, electrical and plumbing systems designed to reduce energy costs by 30%; a reflective white roof; a 5,000 gallon cistern to collect rainwater and significantly offset potable water used for landscaping; and a crushed concrete aggregate pavement for the storage yard that not only includes recycled content, but will also reduce the heat island effect and reduce stormwater runoff by being permeable. 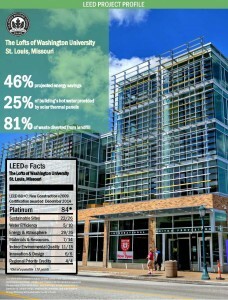 The Chapter is currently collecting information and statistics on all the LEED certified projects in the St. Louis area in order to post project profiles for each project. 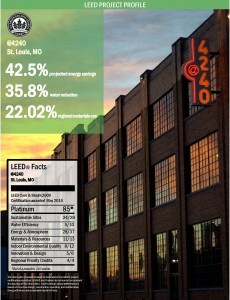 Additionally, the LEED page of the website will soon feature a map of all LEED certified projects in the St. Louis area!